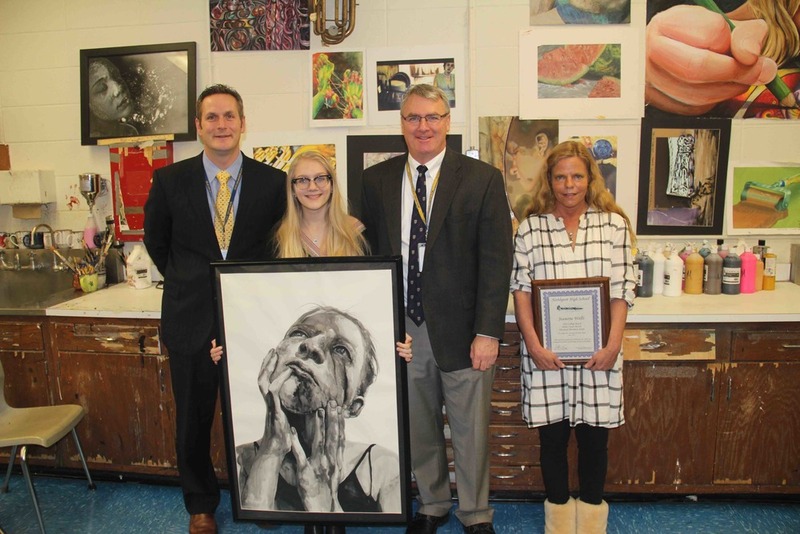 Northport High School junior Jeanette Wells, second from left, is one of 16 students worldwide to earn a perfect score on the AP Studio Art Drawing portfolio.Wells is pictured with Principal Daniel Danbusky, Northport-East Northport Superintendent Robert Banzer and Margaret Minardi, her AP art teacher at the high school. Northport High School’s Jeanette Wells is perfect. The 16-year-old junior is one of 16 students in the world to earn a perfect score on the Advanced Placement Studio Art Drawing portfolio, a three-part submission graded by a panel of educators from across the country. Wells was one of 18,585 students in the world to submit a portfolio last May as part of the AP Studio Art Drawing class, according to a spokeswoman for the College Board, the nonprofit organization that offers AP classes. She took the AP class in order to earn college credit during her sophomore year at Northport High School. As part of the AP class, students are tasked with three separate sections. In the one section, students must demonstrate every kind of medium, subject and point of view through several techniques, including drawing and painting, Minardi said. In another section, students must produce a 12-piece series of related work in order to show focus. The final section involves quality, which consists of five pieces of artwork.. The portfolio that Wells submitted consisted of the 29 pieces of artwork she created throughout the three sections. It was graded by a panel of college professors and AP teachers on a scale of 1-6.